In Us, Winston Duke, Shahadi Wright Joseph, Evan Alex and Lupita Nyong'o (L-R) play the members of a family — and their doppelgangers. 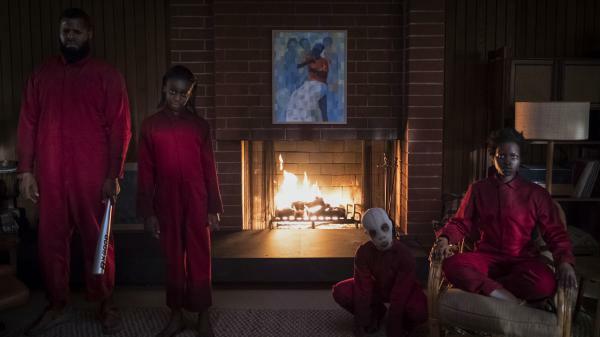 The new movie Us, Jordan Peele's follow-up to Get Out, is a horror movie. It starts with a black family on vacation. They go to the beach; dad buys a boat. Then things start getting creepy. One night, another family dressed in red jumpsuits shows up in front of the house. And each member of this new family — mom, dad, sister, brother — is an identical copy of the family inside. They're doppelgangers. "It starts with the fear that I can't explain," Peele says in an interview. "This idea that if I saw myself on the street, you immediately know that one of you might go. There's only room for one. And on top of that, if you see yourself, and yourself smiles back at you, you know the other one has the upper hand." I tried to apply this idea of duality to everything in the film. And you know, I think the piece of the puzzle that pushed me to embark on this is this idea of the doppelganger family. That's when the movie sort of went from being about self-introspection to this idea of a societal or collective introspection. 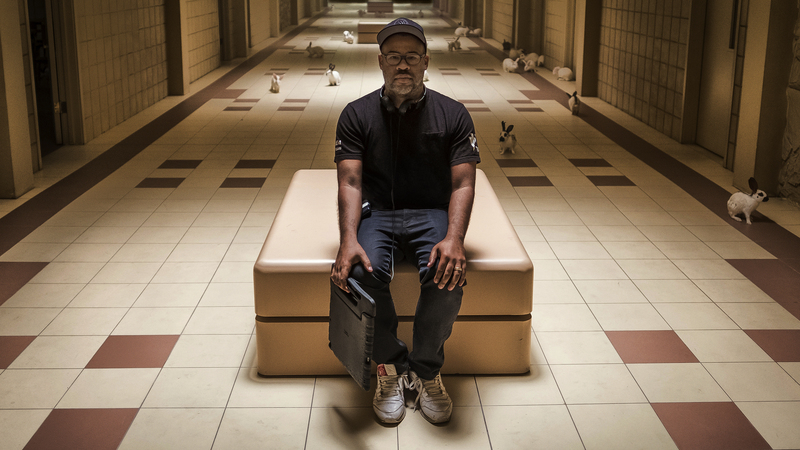 Writer, producer and director Jordan Peele poses on the set of Us. I think a lot of people are catching onto the fact that there's a lot of United States/American imagery in this. And the duality of this country and our beliefs and our demons, I think, is on display. But I think "us" is bigger than that. And I think one of the reasons this movie has an expansiveness is because "us" is subjective. Everybody thinks of the term "us" in different ways — it can be "us" the family, "us" the town, "us the country, "us" humanity. I think in the simplest form, the very nature of "us" means there is a "them," right? So that is what this movie is about to me, is that: Whatever your "us" is, we turn "them" into the enemy, and maybe "we" are our own worst enemy. You have to try to portray as real a world as possible. The reality of how we act in emergency is not necessarily what we assume. Sometimes somebody says something to break the ice or break the tension. Other times, we'll get caught up in something petty, even in emergency. So what I'm trying to do is actually make something that feels more realistic than your average genre film in that there's a lot of ways we respond. Both of these things are about getting a visceral, uncontrollable reaction from the audience. These are not genres that can end with just silence, you know? If it works, then something we don't entirely understand happens to us, you know, in the scream or the shudder or the laugh. So it's that visceral pop. Just by putting a black family in the center of this movie, which is not about race, we see shades of what it means to be African-American that aren't out there. Part of the systemic failure in representation is that we are relegated to boxes. And I think, even if it's something that feels simple or not particularly imaginative, like a black family on the beach, I think it's important, and has a great effect, both within the community and outside the African-American community, to continue to present the spectrum of what we are and how we deserve to be represented. I think that's my style. My favorite horror images are the beautiful ones that are subverted. This is why I was drawn to The Stepford Wives, and movies like Jaws and The Shining appeal to me, is that when you have something idyllic and beautiful and sort of perfect, that's where true horror lies. In this movie, it's even — to present the shiny, happy, "Hands Across America" version of our culture with the promise of the darkness underneath. I think it is connected to getting over my own fears: my fears growing up, my fears as a kid watching movies. I'd always — I'd watch these commercials for the Time-Life Mysteries of the Unknown books. ... And I would freak out. But I would want it. And I had this weird love-hate where I would ... if I got to sneak a horror movie at a friend's house, there was nothing more I would want to do. And then of course it would keep me up at night. ... And watching [horror movies] does that for me to an extent. But creating them, I think, helps me deal with fear and makes me feel stronger and braver. Marc Rivers and Mallory Yu produced and edited this interview for broadcast. Patrick Jarenwattananon adapted it for the Web. Director Jordan Peele has followed up his 2017 hit "Get Out" with a horror movie that will scare the hell out of you. The film's called "Us," and it starts with a black family having fun on vacation. They go to the beach. Dad buys a boat. TIM HEIDECKER: (As Josh Tyler) You hear Gabe got a boat? WINSTON DUKE: (As Gabe Wilson) Crawdaddy (ph) (laughter). SHAHADI WRIGHT JOSEPH: (As Zora Wilson) He's kidding, right? LUPITA NYONG'O: (As Adelaide Wilson) He's not kidding. CHANG: But then things start getting really creepy. One night, another family shows up in front of the house, and it quickly becomes clear that each member of this new family is an identical copy of the mom, the dad, sister and brother inside the house. They're doppelgangers. DUKE: (As Abraham) So once upon a time, there was a girl. And the girl had a shadow. JORDAN PEELE: It starts with the fear that I can't explain, which is this idea that if I saw myself on the street, you immediately know that one of you must go, you know. It's only room for one. CHANG: That's director Jordan Peele. When we spoke, I asked him, what is it about looking into a mirror that's so terrifying? PEELE: It makes you question, you know, your identity. You know, the one thing we can count on in our own consciousness is that it's ours, and this place in the universe is ours - the one thing that we can know for certain. And when that is put into question, it's just this existential crisis. Now, I mean, throughout history, the doppelganger mythology exists. And what I think it represents is this is everything that we don't face about ourselves. It is a representation of the guilt, the trauma, the fear, the hatred that might be buried underneath layers of pleasantry, all that stuff that we don't deal with. When it comes out, it'll come out in crazy ways. CHANG: ...That song comes back in this creepier slowed-down version. LUNIZ: (Singing) I got five on it. CHANG: Even that song has an evil doppelganger in this movie. PEELE: Yeah. Yeah. I tried to apply this idea of duality to everything in the film. And, you know, I think the piece of the puzzle that pushed me to embark on this is this idea of the doppelganger family. That's when the movie sort of went from being about self-introspection to this idea of a societal or collective introspection. CHANG: Which makes me think about the title of the movie. Your film is called "Us." Who is us ultimately, or who's them? PEELE: Well, that's the question. You know, I mean, I think everybody thinks of the term us in different ways. It can be us the family, us the town, us the country, us humanity. I think the, you know, in the simplest form, the very nature of us means there is a them, right? So that is what this movie is about to me is that whatever your us is, we turn them into the enemy. And maybe we are our own worst enemy. CHANG: I notice how you use comedy to ratchet down the tension in this horror movie. There is this one scene where the family has a chance to escape the house. There are just seconds to spare. And then they're having this argument in the car about who gets to drive. And part of me is laughing, but the bigger part of me is like, you idiots, just go. CHANG: How do you release tension in a movie without destroying it completely? PEELE: Well, you have to try to portray as real a world as possible. The reality of how we act in emergency is not necessarily what we assume. Sometimes somebody says something to break the ice or break the tension. Other times we will get caught up in something petty, even in an emergency. PEELE: So, you know, what I'm trying to do is actually make something that feels more realistic than your average genre film in that there's a lot of ways we respond. CHANG: Why don't we see more black families starring in horror films? I think I read that you were telling a reporter like, look, you see a black family at the beach. And a black man actually buys a boat in this movie. Tell me why those details were important to you. PEELE: Well, you know, so just by putting a black family in the center of this movie which is not about race, we see shades of what it means to be African-American that aren't out there. You know, part of the systemic failure in representation is that we are relegated to boxes. And I think, you know, even if it's something that feels simple or, you know, not particularly imaginative - like a black family on the beach - I think it's important and has a great effect both within the community and outside the African-American community to continue to present the spectrum of what we are and how we deserve to be represented. CHANG: Something else you seem to explore in both "Us" and the movie "Get Out," there are these stories about pleasant picture-perfect surfaces hiding some ugly underbelly. Is that connection between the two movies deliberate? PEELE: I think that's my style. My favorite horror images are the beautiful ones that are subverted. You know, this is why I was drawn to "The Stepford Wives," and movies like "Jaws" and "The Shining" appeal to me is that when you have something idyllic and beautiful and sort of perfect, that's where true horror lies. In this movie, it's even, you know, to present the shiny, happy, hands across America version of our culture with the promise of the darkness underneath. CHANG: Do you plan to live in the horror genre for a while? Why do you love scaring people so much? CHANG: And you would freak out. PEELE: And I would freak out. And I would - but I would want it. And I had this, you know, this weird love-hate where I would, you know, if I got to sneak a horror movie at a friend's house, I would - there's nothing more I would want to do. And then, of course, it would keep me up at night. CHANG: Right. So making scary movies is like exposure therapy for yourself. PEELE: And, you know, watching them does that for me to an extent. But creating them, I think, helps me deal with fear and makes me feel stronger and braver. CHANG: Jordan Peele is the director of the new horror movie "Us." Thanks very much for talking to us. PEELE: Thank you so much. Transcript provided by NPR, Copyright NPR.